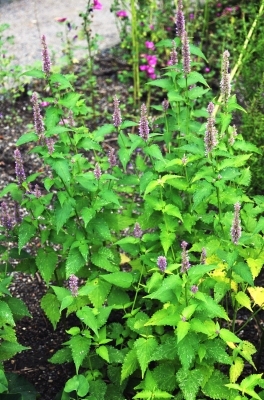 Agastache mexicana is a herbacous perennial plant producing a cluster of erect, branched stems from 50 - 150cm tall from slowly-spreading rhizomes. ]. The plant is also grown as an ornamental, valued especially for its flowers and their ability to attract bees, butterflies and humming birds to the garden. Southern N. America - northeastern to southern Mexico. Agastache mexicana is usually found at elevations above 2,000 metres in the subtropical to tropical regions of Mexico. It is unlikely to tolerate more than a few degrees of frost, though has been seen growing successfully at Kew Botanic Gardens in the UK, which is in climate zone 7. The flowers are very attractive to bees, butterflies and humming birds. Compounds isolated from this plant include diosmetin, gardenin A, acacetin, ursolic acid, and tilianin1170].